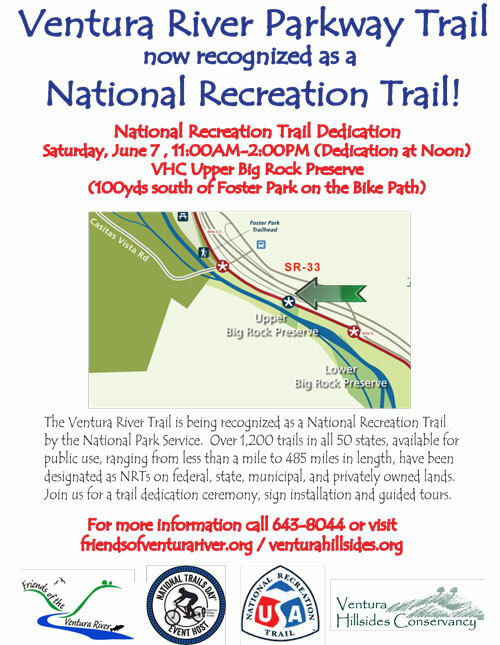 The Ventura Hillsides Conservancy and Friends of the Ventura River will be celebrating National Trails Day® on Saturday, June 7 from 11AM-2PM at the Conservancy’s Big Rock Preserve just south of Foster Park along the Ventura River Parkway Trail bike path. American Hiking Society’s National Trails Day® is a nationally recognized trail awareness program that occurs annually on the first Saturday of June and inspires the public to discover, learn about, and celebrate trails while participating in outdoor activities, clinics, and trail stewardship projects. National Trails Day® is a registered trademark of American Hiking Society. The Ventura River Parkway Trail (Ventura River Trail and Ojai Valley Trail) is being recognized as a National Recreation Trail by the National Park Service. The National Recreation Trails program works to preserve and celebrate our nation’s pathways. Over 1,200 trails in all 50 states, available for public use, ranging from less than a mile to 485 miles in length, have been designated as NRTs on federal, state, municipal, and privately owned lands. Volunteers will be working on trail clearing and sign installation from 11AM to 12PM. A trail dedication ceremony and REI grant award presentation is planned for 12PM followed by guided tours of the property and a raffle. The Conservancy’s preserve offers trail users access to the Ventura River and the Big Rock swimming hole. The event is free and open to the public. Next post: The Ventura River Parkway Trail — now a National Recreation Trail!